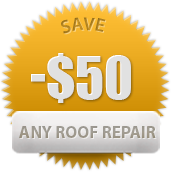 SUBMIT THE FORM BELOW TO REQUEST A FREE RESIDENTIAL ROOF REPAIR INSPECTION. A problem with your roof can plague you, eating up your energy, compromising your safety, and making you worry about the costs. We understand the sinking feeling homeowners get when they realize that their roof isn’t as sturdy as they thought it was. There are also times when a problem seems negligible but is really a sign of something bigger. What’s the scope of the issue? How can it be fixed successfully? Will the repairs come at a reasonable price? Should you opt for a roof replacement instead of repair work? If you’re concerned about your roof, don’t hesitate to reach out to experienced professionals. We understand your concerns, and we’re committed to restoring your roof to good condition and reducing the chances of future problems. You’ll be reassured by the methodical way we perform our work. We respond quickly to your call, arrive on time, and begin our careful inspection of the situation. From the shingles to the flashing to the drip edge, we know every corner of a roof and can detect the problems undermining it. When we perform repairs, we take care not to disturb any other part of your roof or home. We keep our work clean and appropriately contained. We also provide you with progress updates. For example, if we discover that a leak in your roof may have led to other structural issues, we discuss possible solutions. Your home will get treated with the same devotion and care that we’d give our own homes. Shingles can come loose or break, leaving areas of your roof dangerously exposed and more prone to water damage and other problems. While ensuring that the new shingles match the ones already there, we make your roof whole again. If other contractors who worked on your roof made mistakes, you can depend on us to help you fix the problems. For example, it’s possible that some of the flashing wasn’t installed well, increasing the chances of a leak. Even a resilient roof can suffer weather damage. Nails, shingles, or panels can come loose, different kinds of materials can wear away, water can accumulate, and holes can form from the impact of debris. Even if the damage seems minor, call us. Among the variety of repair services we offer, fixing the source of leaks is one of the most important. If neglected, a leak can cause a surprising amount of damage to the roof, foundation, and interior of your home. We’ve assembled a team of highly trained professionals who combine their skills and knowledge to tackle a wide range of roof repairs. When you entrust your roof to high-quality professionals, you experience some relief from your stress. The problems with your roof seem less overwhelming. We give you the comfort of quick response times and effective solutions. You’ll never feel ignored or shut out. We invite you to share your thoughts with us and give us your feedback about our approach to repairing your roof. We don’t sign off on a repair job until we know you’re satisfied. Our work isn’t superficial. Even during minor repairs, we keep an eye out for potentially major problems brewing beneath the surface. We give you accurate assessments of the condition of your roof.